As many of you know, 20th Anniversary. Beginning with just two Danish brands, they now exclusively import over 35 of the best design brands from seven key markets around the world, from furniture to lighting. 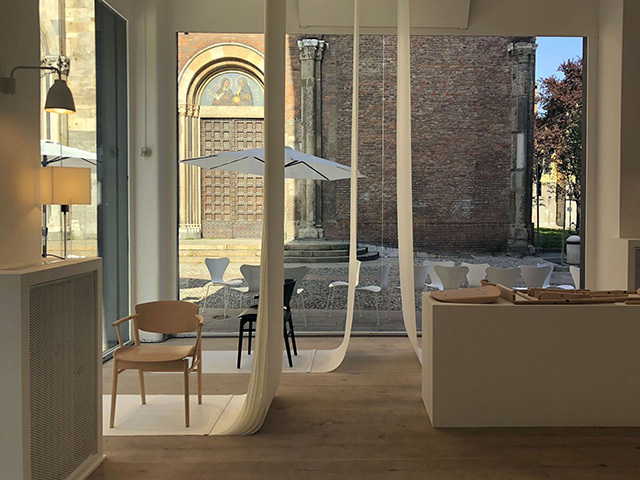 Fierce campaigners for the education and advocacy of authentic design in Australasia, Cult travels to the Salone del Mobile in Milan each year, reporting on the latest news and happenings from their partner brands. Inspired from afar, this year I'm thrilled to be teaming up with Cult to share some of their findings, which I'll be spreading across two blog posts. 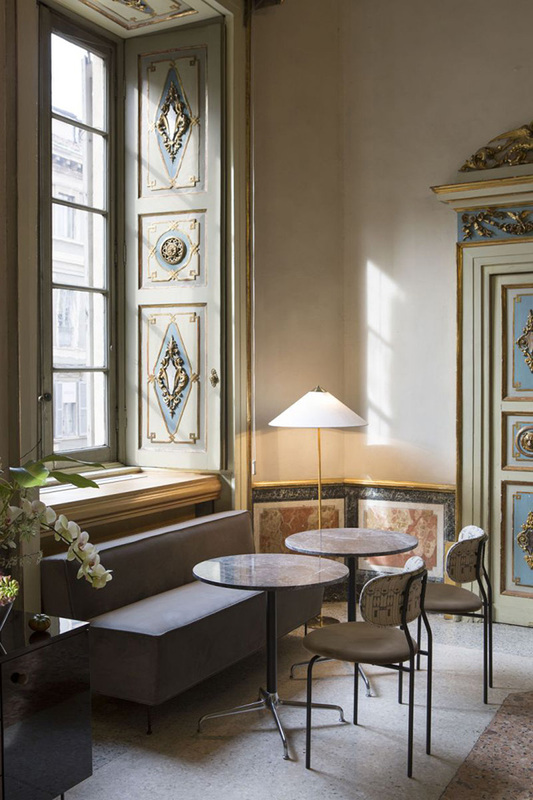 Starting with Gubi, the Danish merk presented their most comprehensive collection to date within the breathtakingly beautiful Palazzo Serbelloni - a grand Milanese palace that has witnessed more than two centuries of Italian and international history. 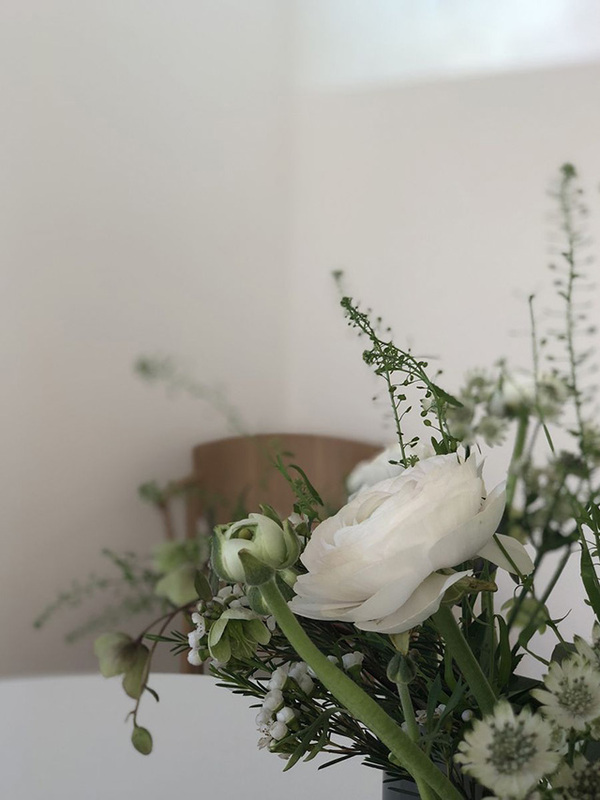 Providing a magnificent backdrop to showcase the brand's new designs alongside existing pieces of their collection, I've picked out some of my favourites. 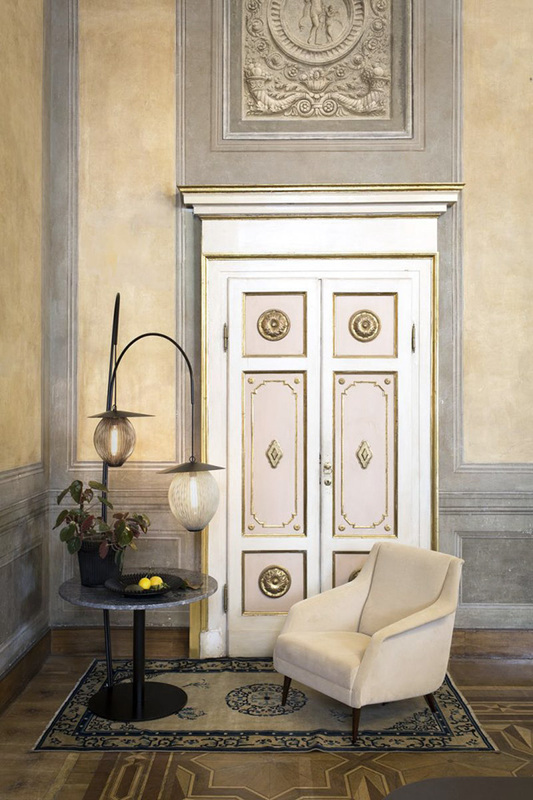 Elegant yet sturdy, the C-Chair by Marcel Gascoin is characterised by voluminous legs juxtaposed by an inviting seat in lighter material of cane, straw or fabric. 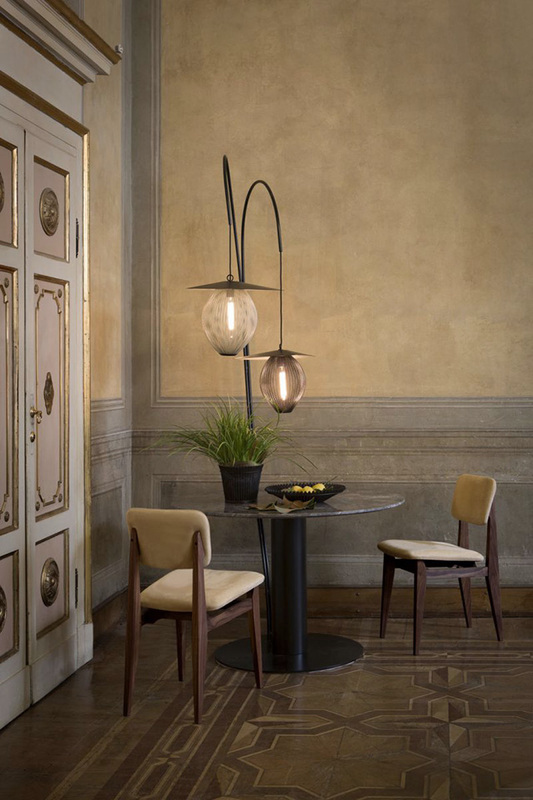 The 9602 Floor lamp by Paavo Tynell alongside the Coco Chair by OEO Studio and Beetle Table by GamFratesi. 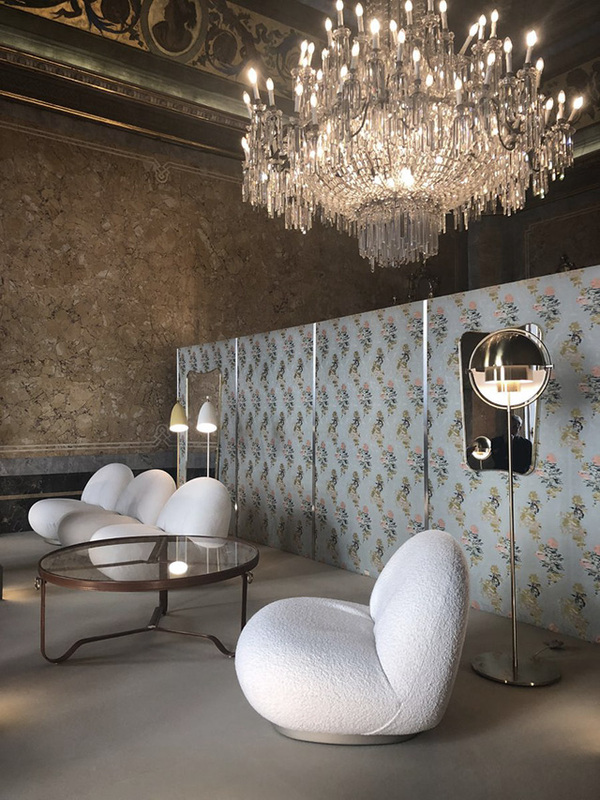 The exhibition saw Gubi reveal for the very first time some of the most notable mid-century designers, introducing the Finnish master of light, Paavo Tynell together with legendary French icons Pierre Paulin and Marcel Gascoin, and Italian architect and designer Carlo De Carli. I've always loved the striking sculptural shapes of Pierre Paulin's furniture, so I was excited to see the iconic Pacha Chair. 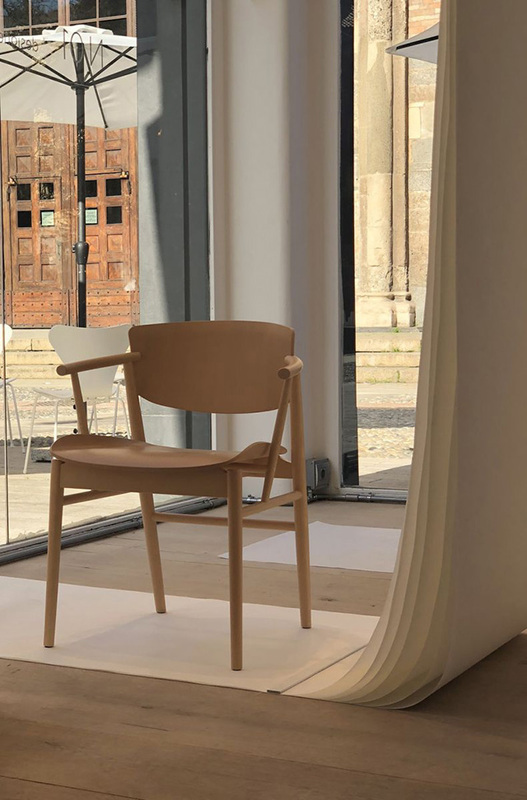 Designed in 1975, Paulin designed the Pacha Chair in harmony with the changing design style of its period, replacing the austerity of post-war design with a new, dynamic approach. I love its rounded form and textural finish. Pacha chair by Pierre Paulin (1975). The Carlo De Carli (CDC.1) collection lounge chair designed in 1954, features an elegantly minimalist design style, typical of the era. Shown here alongside the Satellite Pendant, 1.0 lounge table and Matégot bowl and flowerpot. Gubi also presents several new seating designs from the award-winning duo GamFratesi including the new Bat and Gent collections. I particularly love the new Bat Lounge Chair, which comes in a high and low-back version. Designed with strong references to the interesting characteristics of bats, it features an inviting and distinctive shell reminiscent of the shape of a bat’s wingspan. 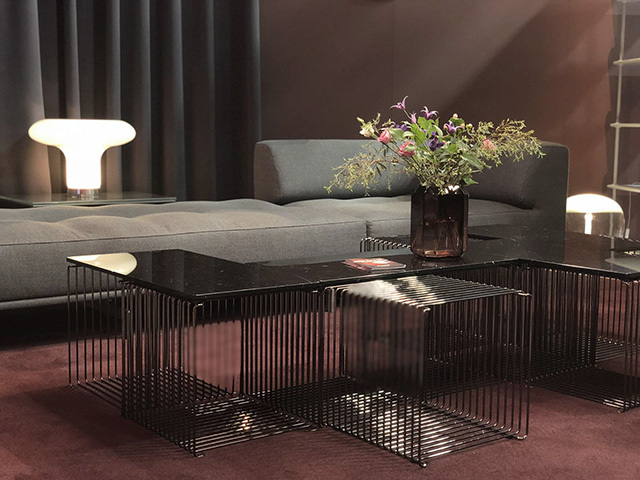 Novelties from the inhouse Gubi Design Team were also launched, along with iconic mid-century furniture by renowned designers Greta M. Grossman and Jacques Adnet. 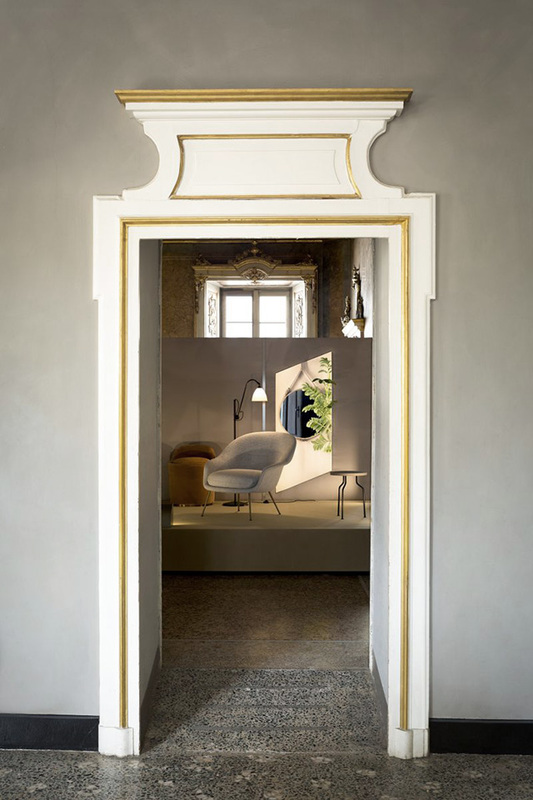 Iconic designs within the existing collections of the Moon, Beetle, Masculo, Coco and Stay have also been extended, with new luxurious materials, colours and sizes. 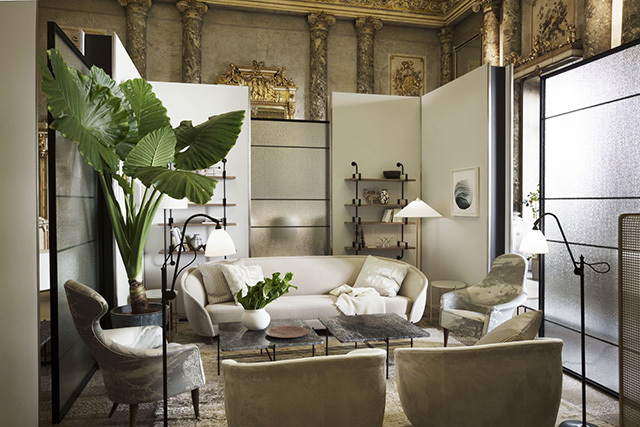 The new Revers collection by Gubi, consisting of a sofa and lounge chair, is a soft and sinuous interpretation of classic shapes and structures. The new Bat Lounge Chair designed by Danish-Italian design-duo GamFratesi. 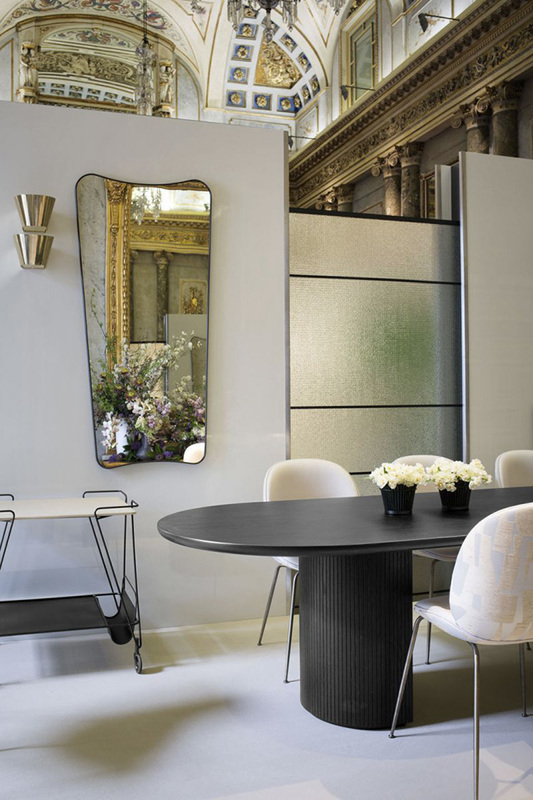 Gubi favourites including the Moon Dining table by Space Copenhagen and Beetle Dining chair by GamFratesi in bold fabric upholstery. 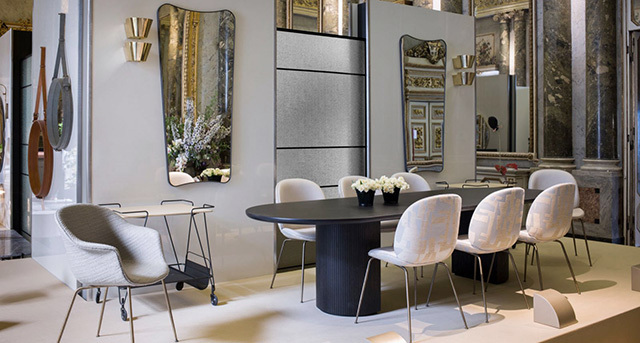 It was wonderful to hear news of Danish merk showroom launch in Copenhagen last year. 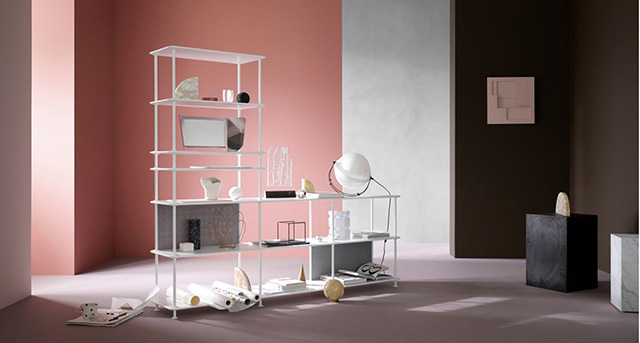 At the fair Montana launched a merk new, elegant and minimalistic freestanding shelving system, Montana Free, designed by the Danish designer Jakob Wagner. 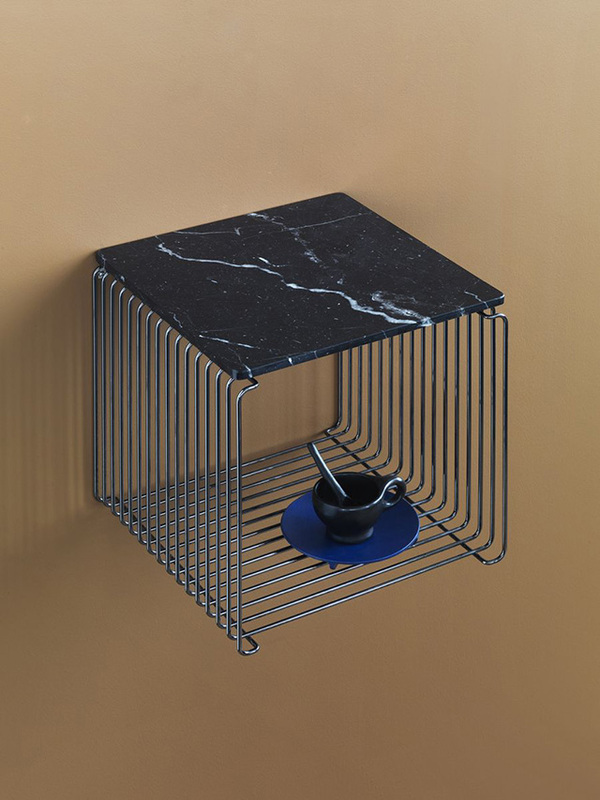 They also introduced Dark Chrome, a new finish for the iconic Panton Wire along with a new dark marble top. As you may have seen on Instagram I recently received some of the Panton wire products for home and I have such high praise for their versatility. The marble finish (which I have in white) is exquisite! The new Montana ranges will be available from Cult showrooms later in 2018. Scandinavian and Japanese design share similar traits in terms of form and function, so it's exciting to see the two aesthetics combine. Beautifully sculptural and highly detailed, the N01 chair is the result of a collaboration between Fritz Hansen and Japanese design studio Nendo. Requiring a meticulous attention to the construction, No1 is handmade with 23 pieces of timber showcasing a pure and honest design that tells the story of the warmth of wood and of uncompromising quality. 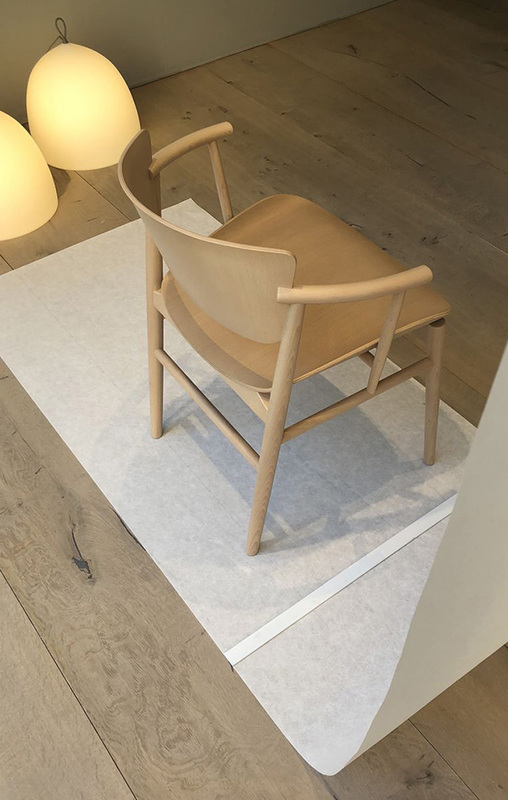 The chair also marks Fritz Hansen’s first solid timber chair in 60 years since the Grand Prix in 1957. The installation took place at the Fritz Hansen Brera showroom where Nendo's Oki Sato created a tranquil scene complete with white drops of layers of thin paper to form the backdrop to highlight the design details. Reading Cult's Q&A with Oki Sato, I was interested to learn that this has been one of the highlights of his 15-year long career. "It truly was a collaborative process between Fritz Hansen and us, one that was coordinated between Copenhagen and Tokyo. The whole experience was quite unique. Every time we visited the workshop in Alleroed outside of Copenhagen - almost every month at the simpulan stage - a new prototype welcomed us. We have put into practice things we noticed, repeatedly reviewed, discussed, and reviewed again many times over. There was no compromise—especially in the simpulan phase of development—with totally achieving the targeted strength and comfort levels of the chair". Constructed as a puzzle assembled by hand, the chair consists of 23 wood pieces that have each been crafted industrially at a Belgian family-owned wood manufacturer founded 1924. The puzzle-like assembling ensures that the construction comes across as seamless as possible in the design. Uncompromising precision is key and even the smallest inaccuracies will cause the production to start over. It certainly looks impeccable in these images. I look forward to one day testing it out in real life! For more insight into the inspiration behind this stunning chair, read the full Q&A here. N01 is available in black coloured oak, natural oak and beech with optional seat cushions in fabric or leather. It will be available in Cult showrooms from June 2018. 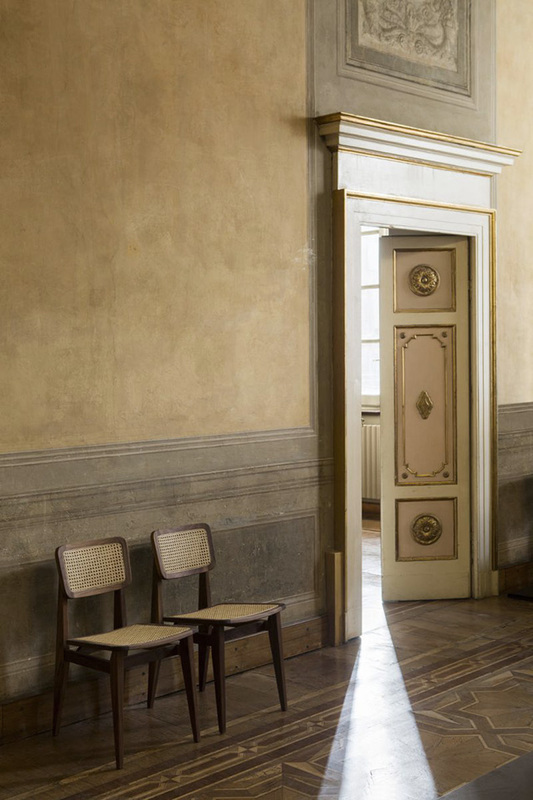 0 Response to "Milan Design Week Highlights Part One | In Association With Cult"